Biotechnology is the use of living organisms, cells and biological molecules to solve problems or make useful products. 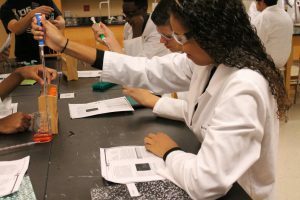 Students will learn about the history, benefits, career opportunities, cell structure and function, law and ethics, experimental design, safety procedures, solution preparation, basic equipment, DNA Isolation/Analysis, sterile technique, culturing microorganisms, environmental monitoring, data analysis, documentation and communication. 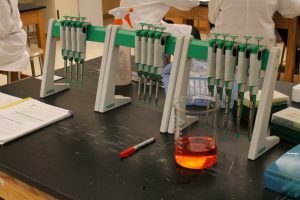 Students will learn about transformation, culture scale-up, recombinant proteins, production of proteins, protein quantification, filtration and purification, ELISA, PAGE, Western/Southern Blot, PCR, Assay Development, quality control, quality assurance, regulatory affairs, and product marketing. At this level, it will be CTE credit only. 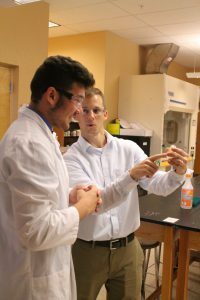 Students will experience independent design and implementation of student projects, simulating employment in a biotechnolgy-based industry and utilizing industry partners.